Donovan Raitt has been teaching guitar to students of all ages and styles in Irvine, CA since 2001. I am currently offering guitar lessons in the Southern California/Orange County area, specializing in all ages, styles and levels of instruction. I offer a simple, practical method to reach any goal that you have with the guitar. Please check out my credentials in the Biography section of the website. My students have gone on to successful careers in music, and have been accepted into some of the best guitar programs in the world, including the USC Studio/Jazz guitar program. I offer lessons in my home studio in Irvine, CA or online via Skype or Google + or FaceTime. For online lessons, you will need a computer, webcam and microphone, and a reliable high-speed internet connection. Lessons can be scheduled either with Monthly Lesson Subscriptions or Individual Lessons. Lessons are $70 per hour or $35 per half-hour when booked individually. 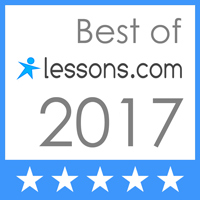 Monthly Lesson Subscriptions offer substantial discounts on lesson costs, and are billed monthly. Lessons are purchased and scheduled directly my website. A credit card is required to reserve a lesson time. You can cancel within 24 hours of your appointment to avoid being charged for that time. Your credit card information is 100% secure through Stripe Payments. I never see your credit card information.